Glen Brook was the original name given to 50 Craig Walk in 1904. A substantia house it was divided into two duplex apartments in 1984. I bought the house in March 2018 and live in Apartment 1, which takes up the ground and basement floors. Apartment 2 is for guests consisting of the first and second floors with use of the communal hallway and front door. Each flat is approx. 1000sq ft - so there is plenty of space. Once I've established a pleasant seating area in the front - very small - garden, guests will be welcome to relax there. I use the back yard where various recycling bins are kept, not convenient for guests, so no need to dispose of the rubbish. Having punched in the code for the key lock box and opened the front door guests proceed to the door marked 2. Coats and shoes can be left here, but not mandatary, unless it's raining and muddy! The house is fully carpeted. 1st floor = kitchen, bathroom and sitting room. The kitchen seats 6 people and there is a fridge/ freezer, electric cooker and hob, toaster, microwave and rice cooker. There is also a washer/dryer, dishwasher, iron and ironing board. All crockery, glasses, silverware, cooking utensils, dishes, tea towel, first aid etc are for guests to use. Complimentary breakfast items, tea, coffee, oil, condiments and rice are also included. The bathroom - has a toilet, sink and a bath with constant hot water and an electric shower that is easy to use. The sitting room is cosy and well decorated and has two sofas, one being a sofa bed. The large Chinese cupboard contains extra bed-linen and pillows for the sofa bed. Guests with laptops find the desk useful and everyone enjoys the Lake District maps and books - especially the illustrated map on the desk. There is an extra electric heater for the colder months and a TV and DVD player. You will see a store cupboard at the top of the stairs and this is useful for suitcases for guests using the sofa bed. Sofa bed - double - in the sitting room; easy to pull out and use, duvet and pillows kept in the Chinese cupboard. Total: Sleeps 5 -6. Additional sleeping option for an extra guest on the sofa bed. I spent most of my working life in Hong Kong and bought up my family there. Before that, I grew up in Lancashire and use to come to the Lake District with my family and I have climbed many of the mountains and fells. Now, although I am a little older and wiser, I continue to enjoy exploring the Lakes and seeing its awe inspiring beauty. This property is located minutes walk away from Bowness and Lake Windermere. Its central, quiet and convenient location will make your exploring much easier. There is a bus to Windermere train station (2 minutes walk away from my home) and on-street parking is available. If you wanted to do some nature exploring, there is a very beautiful walk you can go on very close to where I live and this takes you on to the Dales Way. The Dales Way follows mostly riverside paths and you can walk for as long as you like - it goes as far as West Yorkshire (over 80 km away)! Central heating specifically for the apartment + individual electric heaters. Craig Walk and adjacent Beresford Rd are both free parking areas - I park my car outside the house. Fantastic location, clean, well equipped and very helpful owner! Just come back from a weekend stay at this property. The property was perfect for our needs, spacious lounge with BT TV (including BT Sport), 3 bedrooms (1 double, 1 twin and a small single) . Kitchen is well equipped and great to be provided with basics (milk, tea, coffee and breakfast cereals). The owner, Elaine, was very helpful. Would highly recommend and would certainly stay again. A pleasure having you to stay. Elaine was welcoming and helpful and the house is very well located. This is the first time we have booked with HomeAway and couldn’t be happier with our choice. We’ve visited the area before and stayed at hotels and b&b’s but fancied the freedom of our own place. 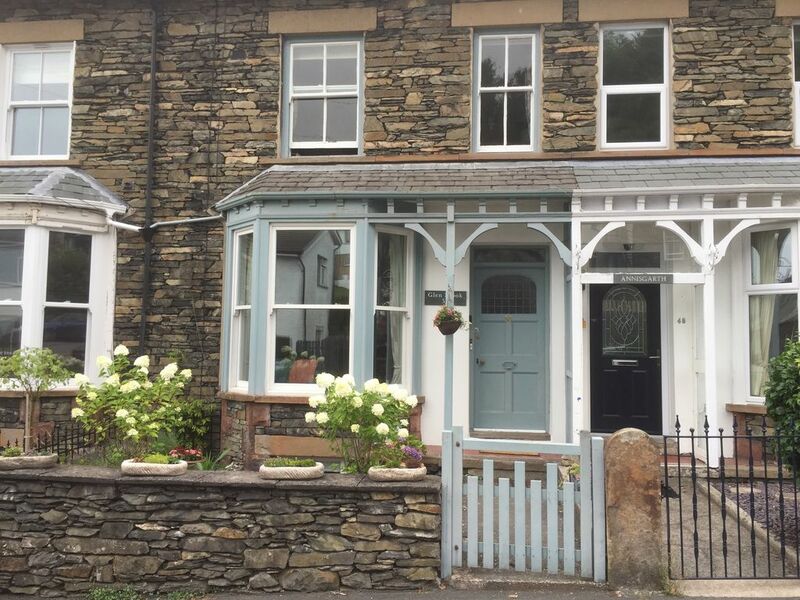 The location is perfect, in walking distance of both Bowness and Windermere. The apartment itself is over 2 levels, everything you could need. The hostess Elaine explained everything very clearly and is on hand if you have a problem. It was the perfect getaway and we’ll be returning for sure. Thank you Andrew it was a pleasure to meet you and have you as a guest at Glen Brook. We loved our pre-Christmas family break. Glen Brook is well situated with everything in walking distance and has exactly what we needed for a home - from - home stay. We will definitely be back! A real pleasure to meet you; looking forward to next time. Fully equipped with everything you could imagine. Would definitely be back. Owner lovely and very accommodating and knowledgable of the area. Thank you very much, pity about the weather! Would love to host you again. A pleasure to know you enjoyed staying at Glen Brook and that it worked for you as a self catering, self contained apartment. As visitors who regularly visit the Lake District, I’m very glad you found 50 Craig Walk a convenient base to plan various walks and a comfortable home to rest and relax. It would be lovely to see you again, thank you for being perfect guests. For people with a car there are 4 main roads, many scenic small roads and some challenging mountain passes; all have amazing views and unforgettable experiences. For guests with cars staying 3-4 nights it's possible to visit all the main areas and take in the spectacular views and for tighter schedules I'm very happy to recommend specific routes to suit individual interests. Even one day exploring Bowness and taking a cruise on the lake is quite magical. that can also include a cruise on Lake Windermere. It's a pleasant stroll down Lake Road from Windermere to the house, but if you follow satnav don't turn left into Craig Walk at the Police Station; it's a steep uphill walk and difficult with suitcases! Continue to Beresford Road, turn left and walk to the junction with Craig Walk No 50 is the 3rd house on the left. When ready to explore further walk back along Beresford Road to Lake Road and turn left into Bowness village. The first thing to notice is the cinema on the right and from this point the Beatrix Potter Attraction is a few minutes away at the bottom of the hill on the right. Shops, restaurants, a post office, all lead to Bowness Bay where you will find Lake Windermere and access to various boating activities and of course very special views. Both drivers and walkers often want to visit the home of Beatrix Potter; Hill Top is at Far Sawrey on the other side of the lake. The ferry for both cars and passengers is located about 0.5 miles along the main road A592 from the Lake Cruise area.The short trip across the lake will take you within 1 mile of Hill Top. On returning to the ferry there are many opportunities to take short hikes along the lake shore - why not try to get as far as Wray Castle! Note: Until October the ferry is closed for cars because of mechanical problems - small boats are taking passengers and bikes across - drivers need to go to Hawkshead first. Homeground in Windermere for breakfast and lunch - closed at 5pm. Queen's Head in Troutbeck, lunch and dinner (for drivers A592 towards Kirkstone Pass).